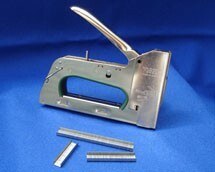 Powerful, professional quality staple gun ideal for stretching canvases. Takes a ranges of Rapid 140 Steel Staples from 6 mm to 14 mm. We recommend either 6 mm or 8 mm staples for stretching canvases.